Clothing/Jewelry Description A light purple sleeveless shirt, jeans and sandals. Distinguishing Characteristics Caucasian female. Brown hair, blue eyes. Emma's upper left front tooth was chipped at the time of her disappearance. She has had extensive dental work. She has a scar on her chin, a scar under her left eye, a scar on her eyebrow and a strawberry birthmark on the front of her right calf. Emma tended to bite her fingernails and toenails in 1982. She may use the first name Christine. 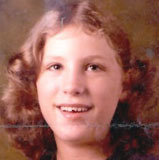 Emma was last seen walking down Robinson Street in Orlando, Florida on July 10, 1982. She lived in Orlando with her mother, stepfather and siblings. She may have been sighted in the area shortly afterwards, but that report was not confirmed. Emma has never been heard from again. She had a history as a runaway prior to her disappearance, but had always kept in touch with her family. Emma frequented the South Orange Blossom Trail and South Street areas of Orlando in 1982. She had an infant son and was not attending school. She may have been working as an exotic dancer and was possibly involved with prostitution. Some reports state Emma may be in the company of her 18-year-old half-sister, Rhonda Cannon. Cannon eventually returned home, however, and stated she and Emma had become separated. Emma was last seen in the company of labor pool workers and may have traveled to Tennessee after her disappearance; rumors placed her in that state in the company of a gas station attendant. Emma's family moved to Marianna, Florida a few months after her disappearance, and now they reside in Missouri. Her case remains unsolved. Updated 9 times since October 12, 2004. Last updated November 2, 2018; age-progression updated.